Smile Team Dental offers a wide range of emergency dental services in Belleville, IL. We are a comfortable and friendly dental office that can handle any type of dental emergency, including tooth extraction, infection and injury. Dr. Kirk Quigless and Dr. Jon Sones and their knowledgeable and compassionate staff go above and beyond to provide you with a pleasant and pain-free experience. With more than 15 years of experience, our qualified team is equipped and prepared to immediately help with your dental problems. We relieve severe toothaches and provide treatment for injuries, infections, root canals and problems with dental restoration such as crowns and dentures. We use advanced techniques and the latest technologies to provide you with superior dental care in a comforting environment. We also are experienced in maxillofacial surgeries and wisdom teeth removal. Dr. Kirk Quigless and Dr. Jon Sones can correct jaw deformities, impacted wisdom teeth, overbites and under bites. We can also treat severe facial and jaw pain. 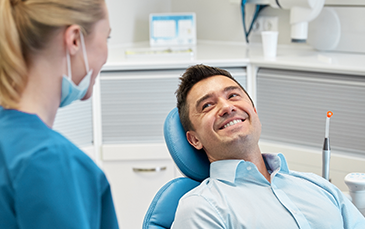 Our dentists are properly trained with the best procedures and equipment to reconstruct your mouth or jaw for an ideal bite and smile. Our goal is to provide the healthiest and most aesthetic smiles with excellent care and treatment. Whether you need teeth extraction, wisdom teeth removal, oral surgery, a tooth extraction or other emergency dentist service, our emergency dental team provides fast relief at a great value. Call us today for more information about oral surgery and wisdom teeth removal in Belleville. We offer emergency dentist services in the surrounding areas of Swansea, Fairview Heights, Edwardsville, Collinsville, Saint Claire, Madison County, Cahokia, Granite City, Shiloh, Dupo, Scott Air Force Base, O'Fallon and Alton, Illinois.